View of Marple Aqueduct near Stockport in Cheshire. It was part of the Peak Forest Canal project which planned to improve the transportation of goods from the Peak Forrest to Cheshire. Local industrialist Samuel Oldknow, who had mills at Stockport and Marple, was a major shareholder of the canal company. 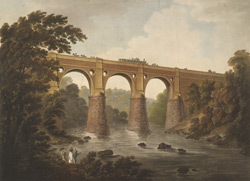 The aqueduct was designed by engineers Benjamin Outram and Thomas Brown and took 7 years to build over the River Goyt. As this view shows it was built of contrasting colours of brick and stone. Water was sealed by a brick canal floor lined with clay. It was a great industrial wonder at the time it was completed. This view was engraved by Francis Jukes (1745-1812) who coloured most of his later printed work in aquatint.